There are two dates at the top 1327 and 1329. Are these both hijri years? And if so, how can this calendar cover two years and have the same Julian and Gregorian dates for two different years? Good question. It may be similar to the Persian solar calendar, which starts March 25 nd uses solar months, but they date from 622 using solar years so the year number would be lower.. Any Ottomanists want to clarify? 1327 and 1329 are too cose to each other to be explained by purely solar calendar. 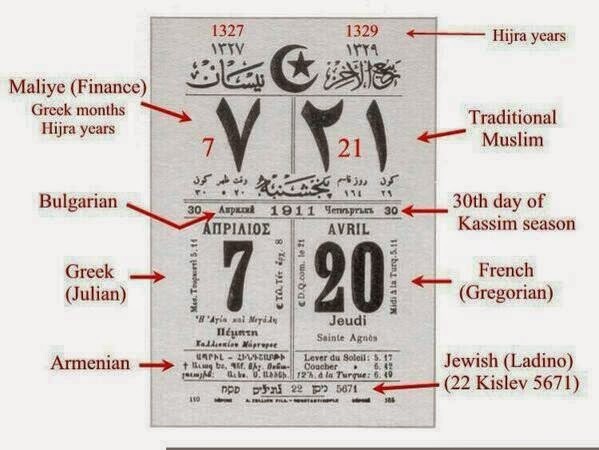 During the Tanzimat Era, the Ottomans adopted what was called the Rumi calendar, a solar calendar for civil purposes that counted from the hijra. By 1911, there was a two year discrepancy between the hijri year and what should be labelled as the Rumi year. Also, the Ladino/Hebrew is for the springtime month of Nisan and not, as written, the wintry month of Kislev. In fact even my limited Hebrew sees it says Nisan. I don't know who added the comments on the side. More questions: The Armenian space, as much as I can see has NO dates, unless too small for me to read. The Bulgarian has a word written on the left hand side. But what is the "Kassim" 30 reference and what is the language on the right hand side? What system were the Bulgarians using? Gregorian? Julian? Other? It would be great to have someone annotate this whole thing. If this is an example of the clarity with which the Ottoman bureaucrats went about their multiculturalism, no wonder they had problems! More ood questions. I think the Armenian date would also be Julian, so maybe they didn't need to repeat the date. The "Kassim" date is in Cyrillic alphabet so I'm guessing it's also Bulgarian? Otherwise no clue why the Bulgaian date doesn't track with Julian or Gregorian. I don't mean to beat a dead horse, but....by 1911, Bulgaria had long bid farewell to the Ottoman Empire. True, there may have been a significant population of ethnic Bulgarians in the Balkan lands that were still Ottoman and the Empire was being flooded with refugee Muslims from Bulgaria and elsewhere in the region. The Bulgarian refugees in Istanbul lived in a particular section of the city, as did other cultural groups. So why was Bulgarian included, if that is what it actually is? Moreover, Bulgarian Orthodox in the Empire would probably adhere to whatever calendar the Rum Orthodox did and the Muslims, the Muslim calendar. Which goes back to the question of "Kassim" and the mystery writing on the right side of that area described as "Bulgarian." Anybody? It's in Cyrillic. Some other Balkan language? I'm out of my depth here. Also, I can't think of another calendar this could be. Is it maybe saying the 30th day of spring (beginning March 21)?